I came from a background of soccer and athletics when I was young. I did soccer for 22 years, and due to this specialized sport, I picked up nagging injuries. So, I looked for some help to prevent and solve these injuries. ​I found MovNat in 2011 and never looked back. I completely invested myself in learning what Natural Movement was about, saw all the gaps in my overall movement game, and decided that I would pursue this route. Now, I don’t consider myself training but moving and getting better every day. As opposed to preparing for a game or a date, I want to be better Tomorrow than I am Today, in all areas of movement skills. About Jérôme: Growing up in the French countryside, Jérôme has been deeply involved athletically from a very early age. Be it rugby, apnea (i.e. freediving), judo, or football. However, it was only after many years of accumulating minor specialized sports injuries, and many hours sitting at a desk, that he discovered MovNat and the Natural Movement method. Having immersed himself in MovNat, he quickly discovered the health benefits for himself, and became professionally involved in sharing Natural Movement with others. Located in Hungary with his wife and children, Jerome has committed the last 4 years to learning and mastering the MovNat method. 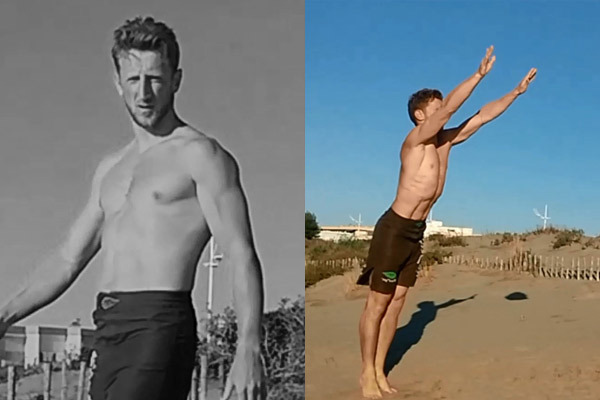 Jerome is a Level 3 MovNat Certified Trainer and the founder of ScarAbsFit, the official MovNat Affiliate in Budapest, which is growing everyday.